I work in an industry with an unending obsession with getting little details right. When you plug in a USB cable or run your fingers over a phone’s touch-screen, there are a dizzying amount of items that have to work properly to avoid user frustration. The amount of detail would slow most people’s brains to a near complete halt if they were suddenly transported to a universe where they actually had to care about all of that. But in our universe there are a class of adventurers who finding meaning in the seemingly boring. Go ahead and thank those people next time you’re able to send a successful text message while weaving through traffic at 70 mph. The various English translations have this as: ‘the fulness of the time‘, ‘the fullness of the time‘ (note how fulness evolved to the fuller form, fullness over time), ‘when the time had fully come‘, and the form shown above (with one less ‘the’). In any case, that phrase is a powerful piece of poetry, packing a significant ponderable notion into just a few words. The strong impression is a preparation for something momentous ready to break out. In sports terminology: With the half-time and full(ness)-time behind us, it’s time to explore the post-game wonders hinted at in that redeeming and adopting language that accompanies the arrival of Jesus. A recent email exchange with an (in-India) Indian colleague, on his use of “thick and fast” where I’d opt for “fast and furious”, motivated me to share a few pointers on negotiating the language Americans once thought they knew. Something it takes visitors a while to realize is that India-English (IE) is at least partly a different language than American English (AE). There is a natural desire for us visitors to India to correct the speakers of IE, as though they’re getting it wrong. But on the local level, they’re actually getting it quite right. Indian: Head bob – gets it. American: He doesn’t get it. I’ll have to explain again. Indian: More vigorous head bob – still gets it. American: Getting exasperated – what’s wrong with this guy? He’s an idiot! Explains more slowly and more loudly (perhaps all the car honking out on the street is interfering?). Indian: Getting exasperated – what’s wrong with this guy? He’s an idiot! He keeps saying the same thing over and over. Bobs head even more vigorously. American: Gives up and moves on to next point. In AE, doubt carries a much more negative sense; the speaker thinks something is likely wrong. In IE, the speaker simply does not understand things yet and is looking for more information or clarification. This tends to put the American speaker into a defensive mode, given that so much doubt is being cast on one’s ideas. 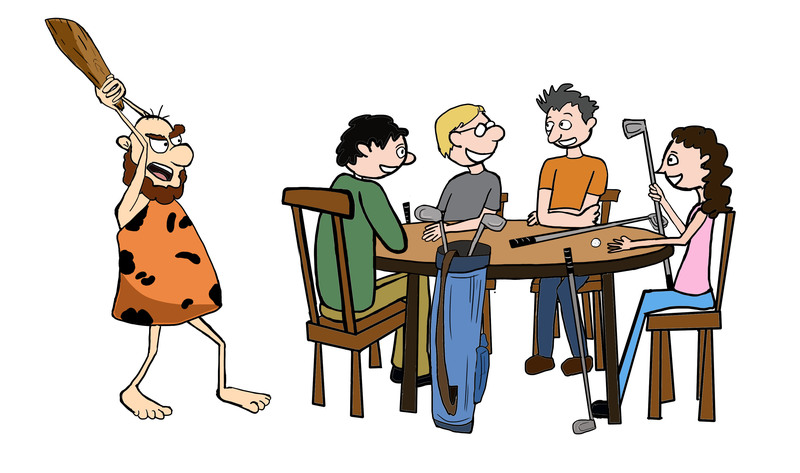 In common AE, a club as a noun can be a big stick for hitting, or it’s a piece of golf equipment, or a group of people with some common interest. As a verb in AE, clubbing is used for nightclub hopping or bashing someone/something over the head. But in IE, clubbing is commonly used as a verb meaning ‘to join things together.’ Where I group or join things, they club them. Perhaps like putting the things into a club. After clubbing you for clubbing me into that club club, I’m going clubbing. This can be illustrated in the diagram below (it’s nice to know someone with clip-artist talent, and exploit them for this post). I’ll leave it to the reader to weave the playing-card club suit into that line, to get bonus points for using six different meanings of club in one sentence. Star Trek (TNG) Captain Jean-Luc Picard had his motivational sayings: “Engage” and “Make it so.” At work we’ve borrowed a similar phrase from IE to encourage action: “Do the Needful.” This sound-bite is just awkward enough to be attractive, and it usually sends us on our way with a smile. Occasionally we even go do the needful. Other folks have noticed this phrase; here’s one analysis. Review time: Now go do the needful and start clubbing those with doubts about head bobbing. Together. 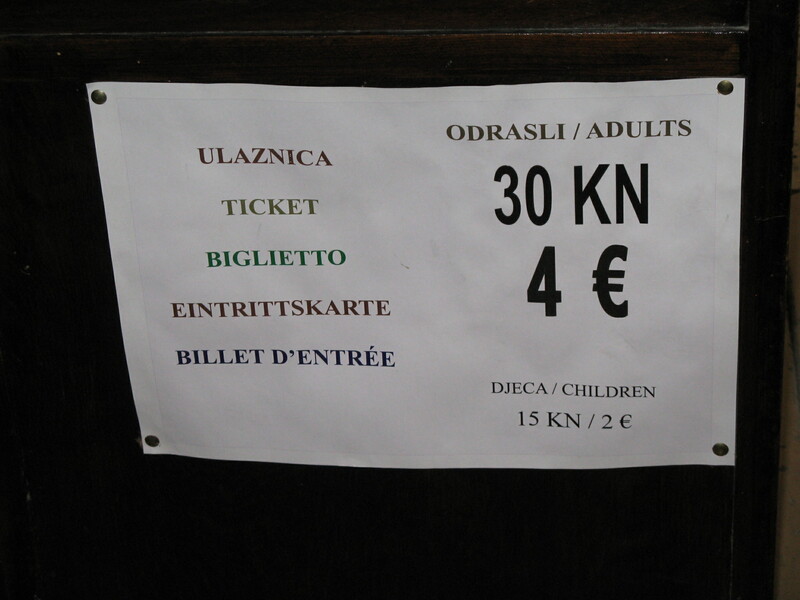 About 15 months ago (Aug ’09) I went on a cruise in the eastern Mediterranean. I guess it’s about time for a shot at a travelogue. 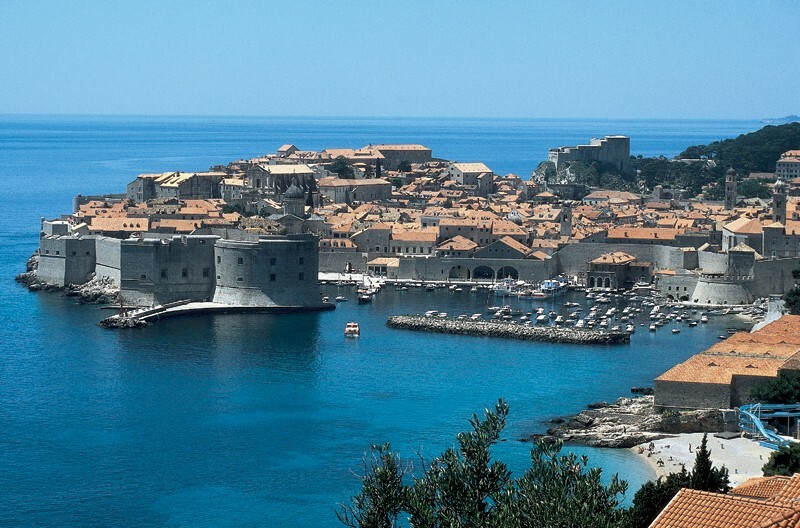 One stop was in Dubrovnik in Croatia, a scenic seaport on the Adriatic Sea (to the “right” of Italy). Little did we suspect that we would encounter one of the world’s top musicians. 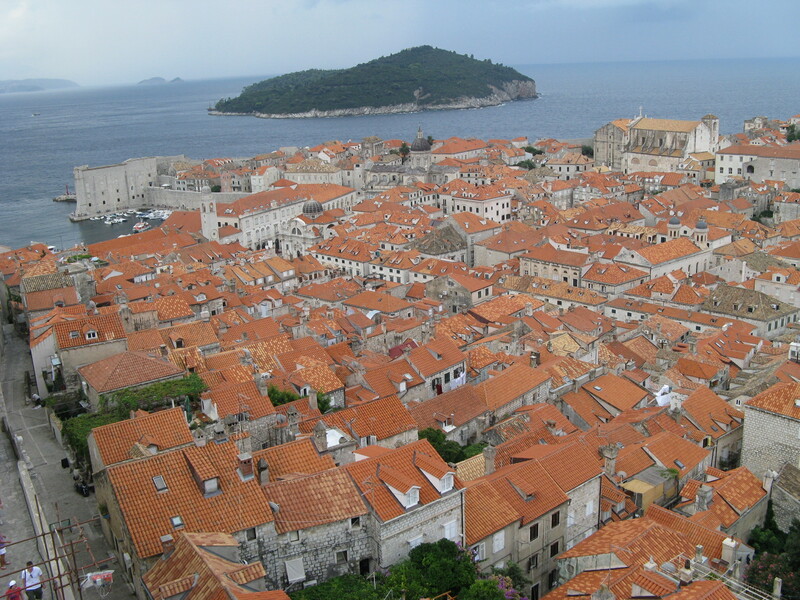 Dubrovnik is at the southern tip of horseshoe(ish) shaped Croatia, a country that has experienced a lot of political and social turmoil (sometimes brutal) over the last century. The city features a surrounding wall that runs a couple miles and dates back (in parts) over a thousand years. The walls provided a useful defense historically; in modern times the city was shelled during 1991 strife, with over a 100 deaths. Most of the physical damage has been repaired, although there are still some signs of the shelling. If you walk the wall, as we did, you may be left a year later with an image of the city that’s dominated by the color orange. 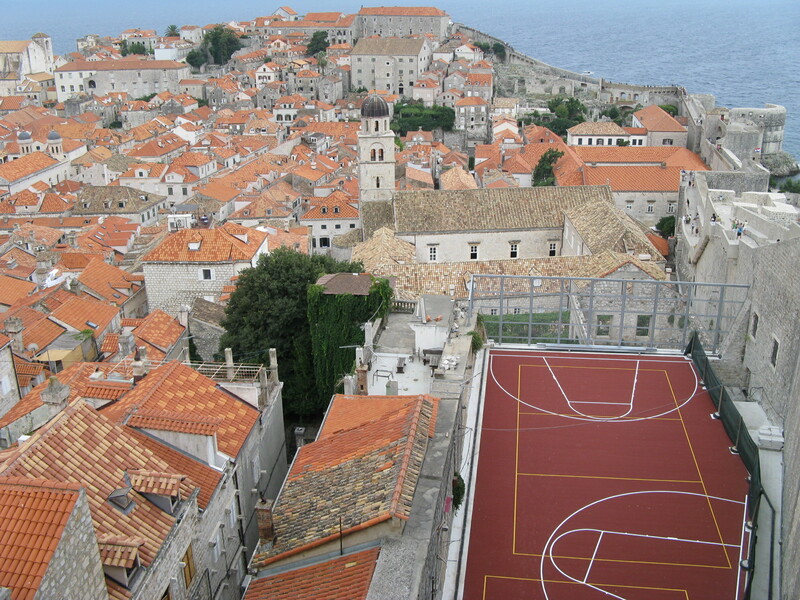 I’m sure there’s a good reason they like that for their roofs — all of them. The walk also revealed an interesting elevated basketball court, which was missing baskets but that’s probably just as well given its elevation. The interesting arrangement of the two basketball hoop areas probably makes sense to those who grow up in orange roof country. 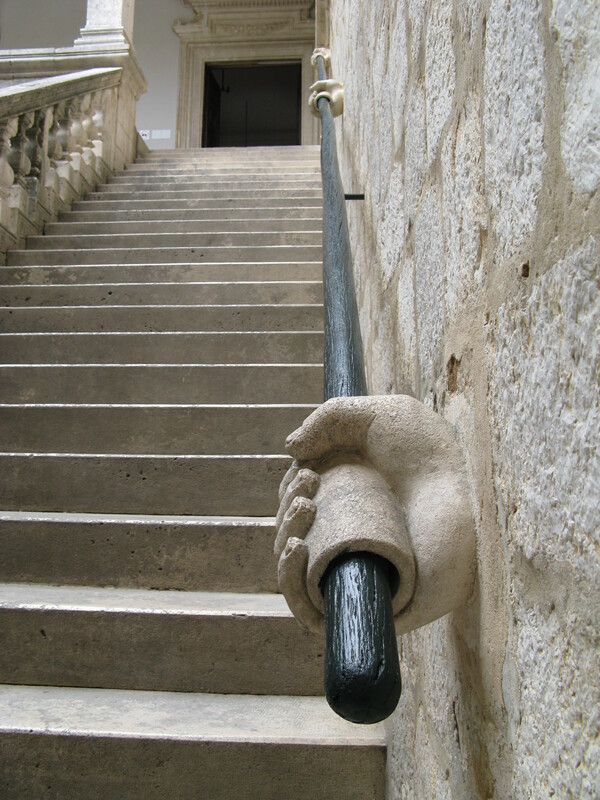 Another building featured interesting hands, appropriately enough, on its handrails. But the highlight — even better than the five language sign — was coming across a set of street musicians that included one who is world famous. Although I was unaware of this fame until I started writing this blog entry. The key band member plays bottles, and I can say unreservedly that he’s without question the best bottle player I’ve ever heard. I bought their CD (15 euros, which I guess would have been about 112 Kuna) and this was honestly my favorite souvenir I picked up on the whole trip. So when I started writing this I google stalked searched the name on the CD and it turns out he’s none other than The Bottleman!! You know he’s legit, not just because he has his own website, but because he’s performed at many places around the world including on Larry King Live. I think the younger generation would express its awe this way: OMG!! And there he was — I could have reached out and touched him, although that notion never crossed my mind at the time. (Watch the video and speculate on how you would have reacted.) I managed to get an up-close video of Bottleman (Zoran Madzirov) as they performed Vivaldi’s Winter (the Allegro non molto movement, I believe). And unlike those carefully edited professional videos, this one captures the true flavor of the streets of Dubrovnik, including: bare feet, a pillar that made it hard to see the whole band, a very-close-up of a lady who walks in front of the camera early on, and of course the obligatory scene of another lady retrieving a banana from a bag near the end of the video. 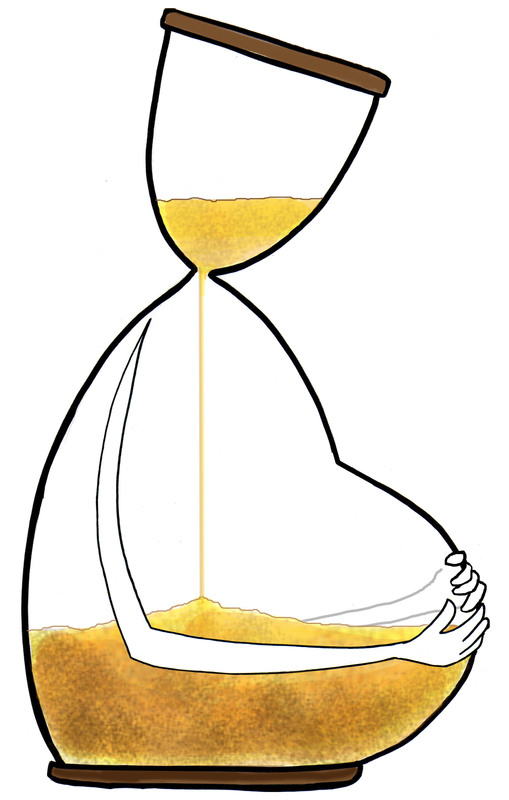 And Bottleman doesn’t just play bottles, he also, well … I don’t want to ruin the surprise, but … he sings! (Sort of.) And you can see him “tuning” his instrument(s) continually as he plays. Note: with the video compression used for posting, you can hear all of the notes but you might not see him strike all of the bottles because he’s moving so fast. But at any compression, who can compete with this premier bottler? He’s been at it for nearly 30 years. 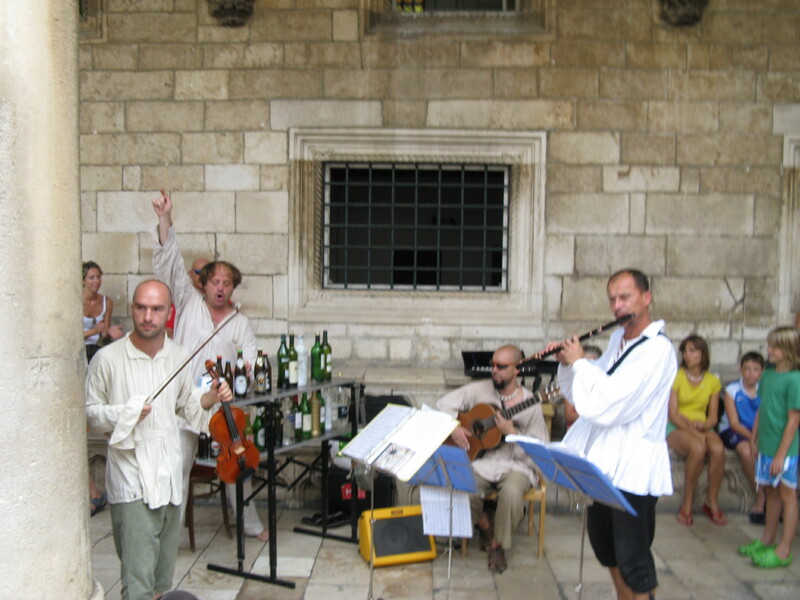 This next picture shows the full band, including the violin player hidden behind the pillar in the video. An intriguing footnote on the CD: The CD states on the case cover that it’s “Music on the bottles” with Zoran’s name and the title, Fiori Musicali. The case information and the CD both list 10 songs. However, none of these 10 songs feature any bottle playing. Lucky for the consumer, the CD actually contains 17 songs. The last 7 are bottle music. 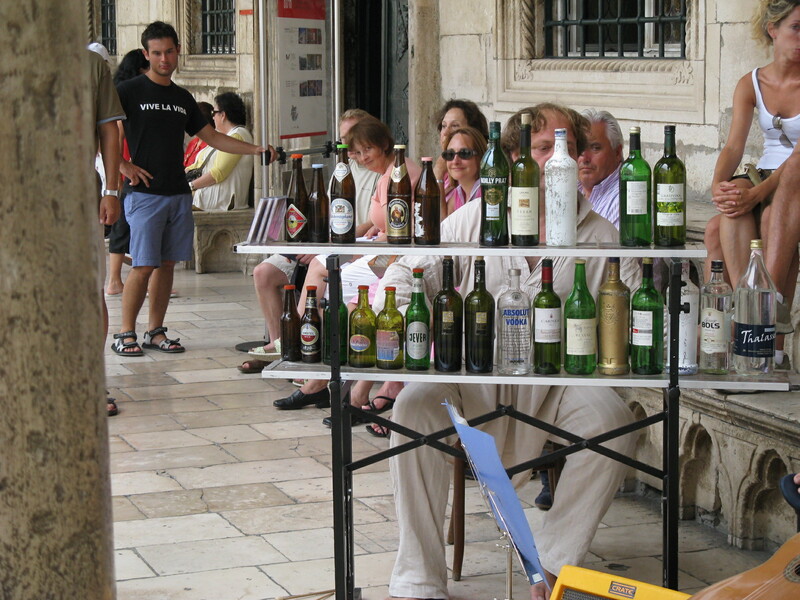 Maybe — just maybe — the bottle music is some kind of contraband in Croatia and needs to be kept a bit secret. Except for that clue on the CD’s cover, and playing it in the streets. If you want to borrow my CD, I will happily rent it to you for just 12 Kuna, cash. OK, that’s enough on the travels for another year or two.